When we think of coastal pollution, we tend to picture dirty water and garbage drifting down river into the sea. But deep underground, our filth reaches the beach by a more secretive route: groundwater channels. A first-of-its-kind mapping analysis has now revealed that a fifth of US coastlines are susceptible to pollution from below the surface. And the problem goes both ways. Groundwater only accounts for a small percentage of the freshwater entering the ocean each year, but it could be a major source of coastal pollution. That’s because as water percolates to depth, it tends to concentrate contaminants from above, including pesticides, fertilizer, and septic tank runoff. On the other hand, areas with minimal groundwater discharge are susceptible to pollution in the other direction—saltwater invading the land and poisoning our aquifers. As sea levels rise, saltwater intrusion is becoming a bigger problem for low-lying parts of the country, particularly the Miami metro area. 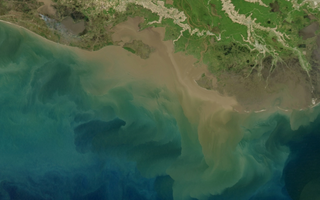 To better understand how the land and sea pollute each other, Sawyer and her colleagues at NASA’s Jet Propulsion Laboratory combined topographic maps and climate models, yielding estimates of coastal groundwater discharge for the entire continental United States. Their results, published today in Science, include the first high-resolution map depicting which coastal areas are vulnerable to groundwater pollution, and which are vulnerable to saltwater intrusion. Overall, this risk analysis matches the pollution patterns we already see along US shorelines. Twelve percent of our coasts, including the northern Gulf of Mexico, the north Atlantic coast and the Pacific Northwest, are susceptible to groundwater contamination, while another nine percent including southeast Florida, southern California and Long Island are at high risk for saltwater invasion. Sawyer was surprised to learn that in America’s largest swamp—better known as South Florida—the amount of groundwater flowing into the ocean has been dramatically reduced by man-made canals. Dug so that land could be drained for sugar farms and cities, this canal network has drastically changed the regional hydrology, drying out the coastline and wreaking ecological havoc in the Everglades. Based on the new analysis, South Florida’s enormous flood control system also seems to have increased the risk that Miami will face drinking water shortfalls in the future.